Below you’ll see a picture of me helping our local Realtor in my home town Sonora, California. 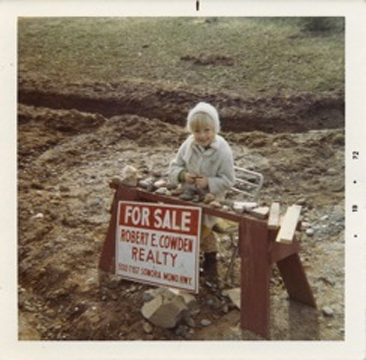 I guess you could say I had an interest in Real Estate even as a young child! Since then I've been promoted to Realtor and Co-Owner of Friday Realty. In between those two careers, I graduated from Cal Poly San Luis Obispo. I then spent over 20 years in Corporate Sales and Marketing, most recently as a Principal Consultant for Dun & Bradstreet. My clients included companies such as LInkedIn, Facebook, Twitter, Yahoo, Intuit, Salesforce and Google. My degree and background has proven invaluable in supporting Friday Realty clients in marketing their homes. With a technological know-how, we make sure the word gets out quickly on a new listing through well executed advertising & marketing campaigns. Our process doesn't stop there. We understand the importance of connecting the right people together and often this is done through our involvement in the community where we choose to live & work - see our giving page. Being a local boutique real estate company, Friday Realty is able to provide our clients with the type of service that can only be found at a small local shop. Ultimately, our clients are pleased - see some of our recent Kudos - with our focus on Communication, Community and all the Connections made along the way.